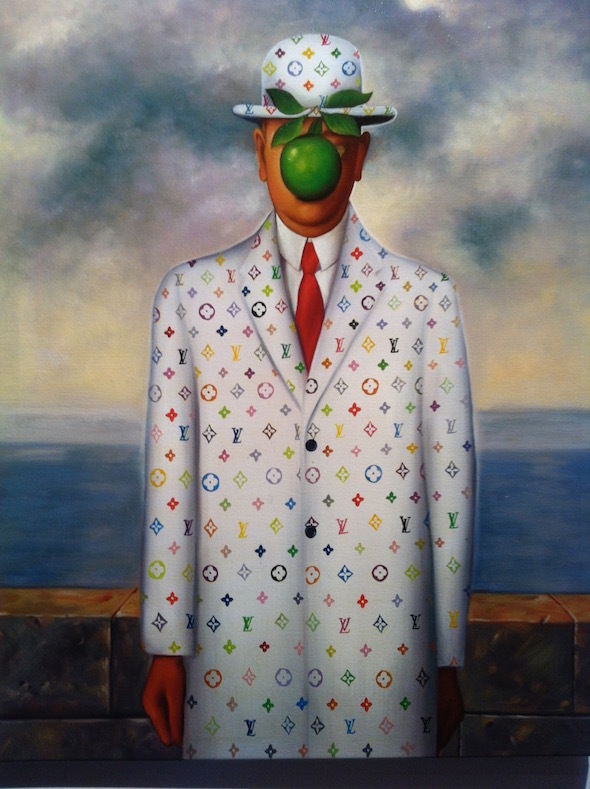 The Son of Man (White) from Brand Paintings by Jason Alper transforms some of the most famous paintings by introducing Louis Vuitton monogram. In these paintings Alper tackled some of the most famous, and classical, paintings and transforms them by introducing the Louis Vuitton monogram. Alper reinvent the meaning of the work, from a humorous yet, critical approach. Do the paintings mean less, or more, now that they have been branded? Jason Alper is from east London, England. Exposed and inspired by an array of cultures around him, his life was and is an ongoing dichotomy. In the past decade, Jason has been an influencer in the world of popular culture, collaborating with Sacha Baron Cohen. He is known as a fearless costume designer with an artistic and irreverent eye, and for creating the iconic and memorable characters of Ali G, Borat and Bruno. Always one to push the envelope, Alper made the decision to use his inventiveness by expressing his talents in a new medium, one that has always been at his core, art. His wry fusion of contemporary and classic icons is served up with the same satire and irony that has characterized his work as a costume designer. After his first sell out art show in Los Angeles, “It’s all Back On”, he has recently displayed new works entitled “Proletarian Drift & The Enfranchisement Of The Bourgeoisie In The 21st Century”, a collection of oils and sculptures. “Since oil has received so much bad press lately, I felt that it was time to do something positive with it”. Jason Alper has been a costume designer and stylist for the past 20 years, mainly in the world of comedy. In 2007 he moved to Los Angeles, where he continues to design costumes and create art.